For U.S. Army veteran Demecia Rogers, the rough years began during her deployment to Iraq in 2003. They might very well have continued, had she not reached out to Wounded Warrior Project® (WWP) – a decision that laid the foundation for the support network she is part of today. When the U.S. joined the Global War on Terrorism, Demecia went downrange to do her part as a communications specialist with the 63rd Chemical Company, 101st Airborne Division. Training taught her to be vigilant when on the lookout for the enemy. The adversary she would eventually face, however, was on her side of the battle line – a situation for which she was less than prepared. Due to a back injury she sustained while deployed, Demecia was eventually given a medical discharge from the Army, and she said her official goodbyes to military service in May of 2005. What followed was a difficult period of isolation that lasted nearly three years. When she finally decided she was ready to emerge from her lonely struggles, she contacted WWP. The first WWP program event Demecia ever took part in was a women’s multi-day mental health rehabilitative workshop in Corpus Christi, Texas. Coming from a lengthy period of emotional solitude, the gathering was a refreshing change for her. Warriors participated in physical challenges in outdoor environments while connecting with each other and working toward improving their mental health. WWP programs offer settings that provide opportunities for wounded warriors to form bonds. The programs assist veterans with mental health, physical health and wellness, career and benefits counseling, and connecting with other warriors and their communities. Demecia credits the outing as the catalyst on her road to physical and mental recovery. In a WWP survey of the wounded veterans it serves, more than half of survey respondents (51.7 percent) talked with fellow Operation Enduring Freedom, Operation Iraqi Freedom, or Operation New Dawn veterans to address their mental health issues, and 29.6 percent expressed physical activity helps. After her success during the restorative mental health experience, Demecia immersed herself in various WWP programs, including Soldier Ride®. She started to branch out and lend a hand to other veterans service organizations. She began to find her voice. “I’m learning more about how to be an advocate for myself – and how to be an advocate for other people,” she said. As she learned the importance of warrior interaction in the individual healing process, Demecia determined she wanted to be a person who could be called upon for help. She was asked to take part in a mentor training program. 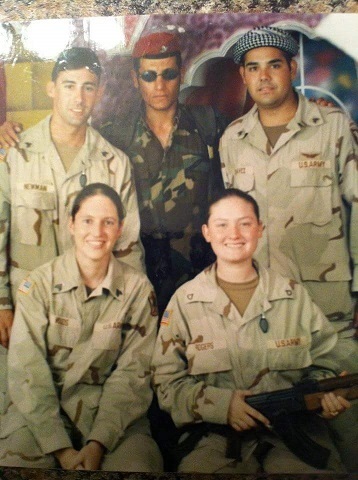 Once the person who looked to others for help with her post-military problems, she is now a source of assistance, empathy, and inspiration for fellow warriors traveling down the same path. Peer support and mentorship plays a significant role in the recovery process as injured veterans rely upon each other’s learned experiences when managing day-to-day challenges. All WWP programs and services have an aspect of this support structure, while the Peer Support program is solely dedicated to ensuring every injured veteran, family member, and caregiver encourages one another in recovery, thus embodying the WWP logo of one warrior carrying another off the battlefield. Being a source of empathy and information has been helpful to Demecia, especially during the low periods she sometimes experiences. Demecia said a great thing about WWP programs like Soldier Ride and others is that the benefits don’t end when the bikes are wheeled away or the workshop campfires are extinguished. Through the benefit of social media, friendships forged at outreach events are maintained, creating a tapestry of support that expands across the country.